Not only is When a fun read chalked full of wonderful anecdotes—did the Lusitania sink specifically because of the poor timing of a captain’s decision?—but Lutheran administrators and teachers will especially find the science behind peak performance and motivation useful and easily applicable to their daily lives. Pink will have you reflecting on when the best time is to send tweets, return emails, do deep work, start school, take a break, make big decisions, conduct internet searches, give students tests, as well as when to drink coffee, stand before a judge, interview for job, run a marathon, and schedule a colonoscopy (the answer is not never). In addition, Pink provides the lastest research on how long and when to exercise, the most important meal of the day (it’s not breakfast), and why short naps are better than long ones. The book is a fun read, provocative, grounded in science, and one that can make an immediate difference in your life today and into the future. When should you read When? Right now! 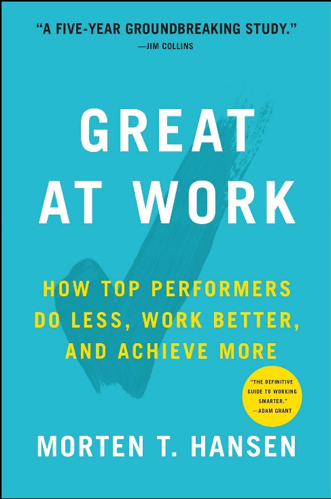 Using years of longitudinal research and putting it together in a compelling package, Morten Hansen’s Great at Work is a tour de force on how to achieve top performance in one’s vocation. His seven “work smart” practices—work scope practice, targeting, quality learning, inner motivation, advocacy, rigorous teamwork, and disciplined collaboration will affirm many dispositions and attributes you have long believed make one a highly competent and effective leader. Yet, his research also produces findings that you might not expect. For example, Hansen ably demonstrates how “following your passion” or “doing what you love” can actually be dangerous and harmful advice. Another of his assertions—that top performers actually collaborate less—is not an idea that is in vogue with other current leadership trends and gurus. Every Lutheran administrator and Lutheran high school faculty would benefit from reading this book. Who doesn’t want to be a top performer by doing less yet working better and achieving more? The research and stories behind Hansen’s work are enhanced by his catchy phrases and explanations. “Do less, then obsess!” he says when demonstrating that top performers do less and more—less volume of activities, but a more concentrated effort on the few tasks you prioritize. “P-Squared” is his term for matching one’s passion with purpose—which his research found critical to boosting a person’s professional performance. Christians assume that other Christians know what servant leadership is or means. Yet many struggle even with a basic understanding of the term servant leadership. Aren’t both words—servant and leader—the opposite of each other? Here’s another question to ponder: Are servant leaders supposed to be subservient leaders? There are many strengths to this 2018 publication. For one, Blanchard and Broadwell edit a book with numerous articles and contributions from well-known Christian and secular leadership gurus. The variety of authors and angles on servant leadership are rich, unique, and provide a comprehensive and sweeping portrait of the topic of servant leadership. Indeed, the authors cover a wide variety of topics you may, or may not, have thought of as related to servant leadership. There is something for everyone in this book. Second, the various topics and themes covered in the book are scholarly and succinct. You can skip around and read the articles that grab your attention. If you have only a few minutes to read in the morning or before you go to bed, you can easily polish off one article or two. Third, the book is perfect for the individual to read and reflect upon, but also as a book study for a faculty, staff, or leadership team. You can divide the articles up neatly by theme, topic, or chronologically. The most interesting attribute of the book is the fact that both Christian and secular writers acknowledge the critical importance and influence of servant leadership.